All that being said, during his administration, Wilson was forced to enter a war he and America wanted no part of. Wilson campaigned for his second term on remaining neutral in the conflicts occurring in Europe, the U.S. foreign policy laid out in the Monroe Doctrine (see Doctrinally Sound). He won a narrow victory on the popular slogan, “He kept us out of war.” But before Wilson was even inaugurated into his second term, he faced reneging on his main campaign promise. When hostilities broke out in July 1914 among most European countries, Wilson announced on August 19th that America would stay neutral. Around the same time, Pancho Villa was leading a revolution in Mexico. Over the years, Villa proved himself and as a result met with high-ranking US officials, such as General John J. Pershing. (see The Forgotten General) That is why when Wilson formally acknowledged Villa’s rival, Venustiano Carranza, as the legitimate leader, Villa attacked Columbus, New Mexico, on March 9, 1916. As a result, Wilson called on Gen. Pershing to chase America’s one time friend. Over 10,000 troops, which included your great-grandfather, accompanied Pershing into Mexico to capture Villa. However, Wilson limited Pershing’s freedom in tracking Villa, restricting how far the troops could go in Mexico. This, along with Villa’s skill in staying just out of Pershing’s reach, denied the US troops victory in the Punitive Expedition. Wilson called Pershing home in January 1917. While he was on route back to America with his men, Germany informed the Allies that they were resuming “unrestricted submarine warfare” (USW), breaking the Sussex Pledge. Germany first instituted their USW policy to block supplies to Britain. They warned they would attack any ship in the waters around Britain. 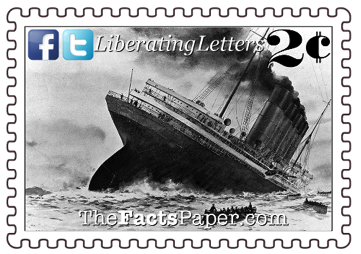 The British ship Lusitania fell victim to the new strategy on May 7, 1915. Over 1,100 lives, 128 American, were lost. The United States protested until Germany apologized and pulled back their USW approach, but it did not completely stop. Germany took many more American lives and ships. To avoid war with the United States, Germany agreed to completely suspend their USW policy with the Sussex Pledge. On May 4, 1916, Germany agreed to approach just American merchant ships, sinking them only if they carried contraband and the crew was safely off-board. Though the United States remained neutral, a British blockade of Germany resulted in America’s ability to only trade with the Allies. With Germany renouncing their pledge, America once again faced attacks on innocent, non-military ships. On February 3, 1917, the United States responded by breaking all diplomatic relations with Germany. Hours later, Germany sank the American ship Housatonic. One hundred years ago today, a German U-boat under the command of Captain-Lieutenant Hans Rose stopped the Housatonic off the Isles of Scilly. After questioning Housatonic’s Captain Thomas A. Ensor, Rose instructed him to order the crew to abandon ship. Rose justified his actions as the ship was carrying supplies to England. As the Americans boarded life boats, the Germans raided the ship’s soap supply. With the ship deserted, the German’s opened a valve, letting water rush onto the hull. The U-boat finished off the Housatonic with a single torpedo. America’s neutrality in World War I sank along with it. Once word of the Housatonic reached the states, Americans began realizing war was inevitable. The final blow came on March 1st when papers printed the Zimmermann Telegram. Around the time Pershing was ending the Punitive Expedition, German Foreign Minister, Arthur Zimmermann, sought to form an alliance with Mexico in case the United States decided to enter into war with Germany. Trying to utilize on the tensions brought on by the Punitive Expedition, Zimmermann sent a telegram to the German ambassador to Mexico, Heinrich von Eckhardt. He offered Mexico financial compensation, as well as portions of the United States in Texas, Arizona, and New Mexico, in return for joining with Germany. British Intelligence intercepted the telegram and deciphered its contents. With an anti-German sentiment already growing in America, they let it cultivate for a few weeks before presenting the telegram to Wilson on Feb. 24th. Wilson immediately called on Congress to begin arming ships against German attacks. He also authorized the release of the telegram to the American people. Upon reading the telegram, which Zimmerman confirmed as legitimate, Americans were now fully behind going to war. On April 2, 1917, barely a month after being sworn in to his second term, Wilson addressed Congress. He requested they declare war on Germany and its allies. Within four days, both houses of Congress had passed the proper legislation, formally declaring war on April 6, 1917. Liberty, there is a saying, “If you don’t stand for something, you’ll fall for anything.” Too many people today have replaced their personal principles with feelings. When that happens, they go whichever way the wind blows. The strongest foundation you can build your principles on is Christ. He is steadfast, He is unwavering, and He is right. You may someday find yourself having to make a personal decision like America did, that goes against your principles. They should be few and far between, but when they do occur, remember you can always call on the Lord for guidance and wisdom on which way you need to go.